Shower guests with a sweet party atmosphere! 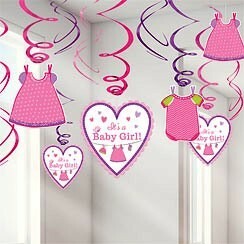 'Baby Girl Clothes Line' Baby Shower Swirl Decorations feature baby clothes and heart cutouts that announce: "It's a baby girl!" Made of durable plastic with a shiny foil finish, these baby shower hanging swirls are easy to display anywhere indoors and out. Shower guests with a sweet party atmosphere! 'Baby Girl Clothes Line' Baby Shower Swirl Decorations feature baby clothes and heart cutouts that announce: "It's a baby girl!" Made of durable plastic with a shiny foil finish, these baby shower hanging swirls are easy to display anywhere indoors and out. Swirl Decorations include: 6 Swirl decorations 3 Swirl decorations with 18cm (7'') cutouts 3 Swirl decorations with 13cm (5'') cutouts Attached hooks.